Manama, Oct. 10 (BNA): Arabian Gulf University (AGU) has hosted an awareness event at the Ministry of the Interior directive of Shaikh Khalid bin Rashid Al Khalifa, Director of the department. 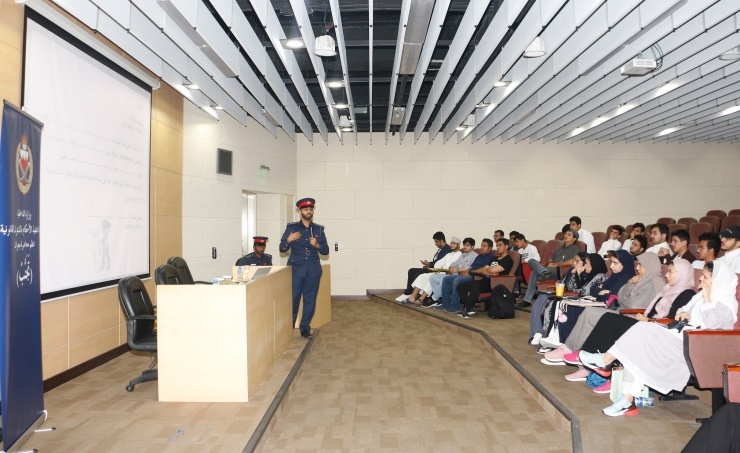 The event saw Abdullatif Sater and Nasser Al-Kubaisi presented a lecture attended by a group of AGU students as part of the Ministry of Interior (MoI)'s Awareness about Contractual Obligations Campaign, which aims to raise public awareness regarding the consequences of neglecting to read a contract before signing it, non-compliance with a contract, neglecting to appear at the law court upon summons, ignoring communication from official authorities, neglecting to seek legal advice in the absence of knowledge pertaining to any clause in any contract, and to avoid transacting with unlicensed entities. Supervisor at the Deanship of Student Affairs Ayesha Al-Subaiei said, "The AGU is cooperating with the Ministry of Interior to educate students, especially freshmen, about the legal obligations in their daily lives particularly students from Gulf States who need to know all the laws governing their lives in the Kingdom of Bahrain during their studies at AGU." She praised the efforts of Interior Ministry in advising and educating students to protect them from susceptibility to fraud or accountability and liability.